This is a very hotly debated topic that we see in our group Slow Cooker Recipes 4 Families on Facebook nearly every single day. Some people choose to take this risk. In fact many people will tell you that they have done so for years and “it’s never hurt me!’. However according to the experts this may be more due to pure luck than anything else. It really is up to you to make an educated and informed risk assessment for yourself! For food safety reasons you should bring your food to temperatures of 60 degrees C (140 degrees F) as quick as possible. This is why it can be a good idea to start the cooking process on high (or auto) to assist the food to reach this safe temperature as quick as possible. However this isn’t mandatory to do! I usually do this for large roasts etc but not much else. I for one WILL NOT take that risk with my loved ones. But you are free to weigh up this risk for you and your family. Cooking from frozen also increases the risk of your ceramic slow cooker bowl cracking due to the sudden temperature changes between frozen food and the heating bowl. If the bowl cracks your slow cooker is then unusable! Reminder: Safest defrosting method is putting your frozen meat in a bowl in the fridge. Overnight will often not be long enough so ideally choose your meat for the following night the day before and defrost it in a bowl on a lower shelf of your fridge for 24hrs. Thanks Jacaline – we do our best to always spread safe advice! I will not advocate for or against it, but until my boyfriend mentioned it, my mother, and now I, have always used frozen chicken in the crock pot. Yes, it “never hurt me”. But I also had no idea. What would the difference be if you thawed it in the microwave and then slow cooked it? I don’t know how it is in other manuals but I read my manual for my slow cooker and it simply says that NO FOOD AT ALL is allowed to be cooked from frozen due to health risks and that is can damage the slow cooker but maybe this vary from cooker to cooker. I am very new to slow cooker,i just want to clarify some doubts before buying. Some slow cooker having small vent hole in the lid other models dont have.Please let me know which one is good to prepare Soup/Broth. If i prepare soup by using the cooker with vent hole lid,will it be drained out all liquid? Will keep this mind. I do my best to defrost my meat first. Sometimes i forget to get it out of freezer. Will be looking after our health from now on. Can I take out the chicken dish that was cooked with frozen chicken tenders and put it in the oven to bake and kill the bacteria? If so, at what temperature. If you slow cooked with frozen chicken do you mean? Okay. Thank you for your response. I will just dump it out and take it as a lesson. What about thawing the meat (I did) in the fridge for the 24 hrs, and then putting in slow cooker…..but because I have to leave for work, that means it will sit in the slow cooker until the thing turns on (on timer) about 3-4 hrs later. Isn’t that also bad? What do you do in that instance? The recipe only calls for 5.5 hrs on low for cook time, hence the timer (so it’s done when we get home from work in evening). I put my frozen chicken breasts into the crockpot with some chicken broth, and then before turning it on, was talking with my sister who said that was dangerous. So I put the crockpot, chicken, and broth in the refrigerator to thaw. I was going to turn on the crockpot today and cook the chicken. But is it safe, since the chicken thawed in the broth? Thank you, I hate to throw out 6 chicken breasts, but don’t want to get sick. Regardless of how slowly the meat comes to temperature, if it reaches temperature for the required time duration, any bacteria is killed. The issue is that people will cook from frozen for only the duration called for by a recipe that is assuming they cook from effectively room temperature (or below, recently out of the fridge), and not check internal temps. That results in under-cooked meats and a high probability of bacteria and food poisoning. Basically, the guidelines from all the sources listed are dumbed-down instructions for people who can’t understand or remember that frozen food takes longer to cook, and internal temperature is critical for reliable food safety. And yes, I’m a scientist. How does this reconcile with recipes that suggest preparing bundles for the slow cooker in advance and storing them in the freezer? Surely putting a frozen piece of meat straight into a slow cooker is a much faster way of achieving this than thawing it on the side for 12 hours first? Health over convenience any day right? How does this work? I’m thawing frozen chicken in the fridge for 24- 48 hours first. Doesn’t that also pose a risk of bacteria growth and have a longer time for said bacteria to grow then it would thawing in a crockpotwhile the crockpot is heating up? How is it safer to thaw for the longer period of time where more bacteria can grow then it would be to thaw and cook over a couple of hours? Because thawing in fridge is safe temps (cold) then cooking by normal means (hot and fast) is safe. 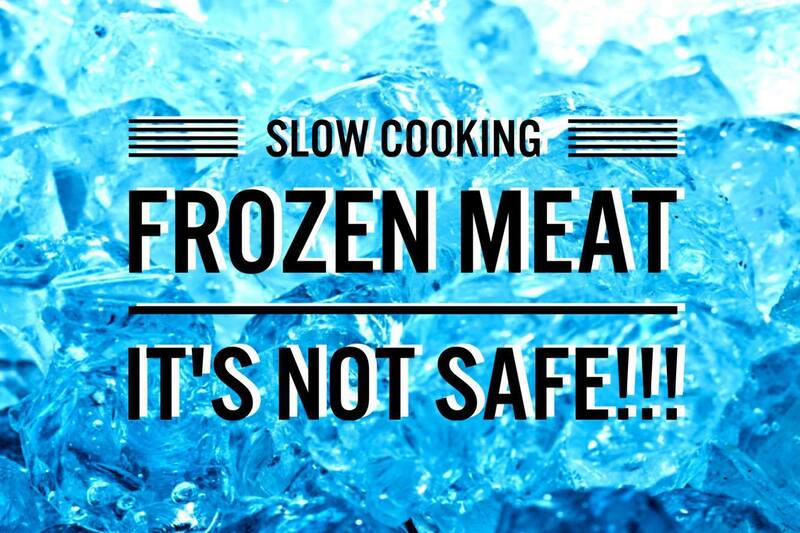 Trying to slow cook frozen meat takes MUCH longer and therefore longer in the risk zone.